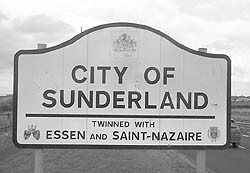 Welcome to Virtual Sunderland, the online community website for the people of the City of Sunderland, England, both past, present and exiled around the globe. Here you will find the largest community web forum around allowing the people of Sunderland to communicate with each other, discuss current affairs and look for friends, relatives or loved ones, especially those ex-pats living aborad. Virtual Sunderland hopes to bring together Wearside folk from around the globe and make your visit both enjoyable and one from which you will return over and over again. This site is an independent site offering a free web based message board and factual information about our City – for those visitors not aware of what Sunderland can offer or for those who live outside the region and want to reflect on their past heritage.